Protein Blend (Whey Protein Concentrate, Whey Protein Isolate, Micellar Casein), Cocoa Powder, Prebiotic Dietary Fiber (VitaFiberTM-IMO from Corn or Tapioca Starch), Natural and Artificial Flavor, Cookie Pieces(Sugar, Enriched Flour [Wheat Flour, Niacin, Reduced Iron, Thiamin Mononitrate, Riboflavin, Folica Acid], Soybean and Palm Oil, Cocoa Processed with Alkali, Invert Sugar, Degerminated Yellow Corn Flour, Cornstarch, Chocolate, Salt, Leaving [Baking Soda, Monocalcium Phosphate], Soy Lecithin), Guar Gum Xanathan Gum, Sucralose, Salt, Aminogen® (Proteases). 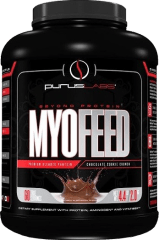 Protein Blend (Whey Protein Concentrate, Micellar Casein, Whey Protein Isolate), Natural and Artificial Flavors, Prebiotic Dietary Fiber (VitaFiber-IMO from Com or Tapioca Starch), Guar Gum, Xanthan Gum, Salt, Sucralose, Aminogen (Proteases). Contains Milk, Wheat, Eggs, and Soy. Protein Blend (Whey Protein Concentrate, Whey Protein Isolate, Micellar Casein), Natural and Artificial Flavor, Vanilla Wafer Pieces (Organic Whole Wheat Flour, Organic Palm Oil, Organic Evaporated Cane Juice, Organic Whole Eggs, Organic Evaporated Cane Syrup, Sea Salt, Organic Pure Vanilla Extract, Baking Powder, Baking Soda), Prebiotic Dietary Fiber (VitaFiberTM-IMO from Corn or Tapioca Starch), Guar Gum Xanathan Gum, Sucralose, Salt, Aminogen® (Proteases). 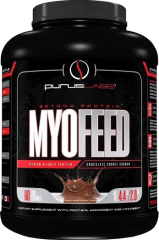 Dec 23, 2015 MyoFeed: New Maple Pancake Protein Flavor for Your Oats!